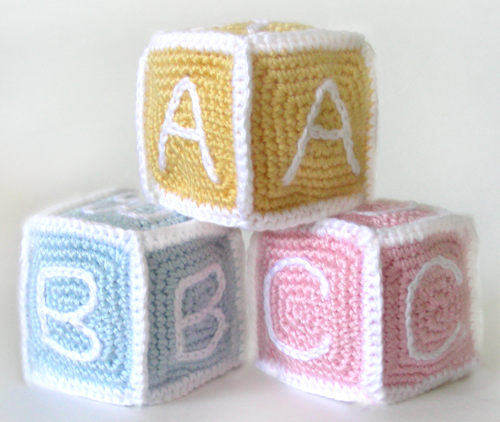 New in the Crochet Spot Store, this baby block pattern allows for adding your own creativity! Yes, you can put letters or numbers on the blocks but you can also get creative and put your own animals or shapes on it if you’d like. The blocks are crocheted in 6 pieces (each crocheted in the round) that are then crocheted together so that no sewing is required. This pattern contains a step-by-step photo tutorial for assembling the pieces. This entry was posted on Sunday, July 17th, 2011 at 12:29 AM by Rachel Choi	and is filed under Best Crochet Patterns. You can follow any responses to this entry through the RSS 2.0 feed. You can leave a response, or trackback from your own site. Cute. A great alternative for younger babies that shouldn’t use hard blocks. These are so cute! Too bad we already have plenty of blocks. Giant legos, wooden blocks, abc blocks, it goes on and on…. what do you stuff these with so they hold the square shape? Hi Teena, you can use regular stuffing like polyester fiberfill. The pattern does a pretty good job at keeping the shape, but be sure not to over stuff as that will distort the shape. Hi, I actually finished making one block and my corners look terrible. Does your pattern explain how to make clean edges on the block when you assemble it? If yes I would be happy to get it! Yes, this pattern has a photo tutorial for assembling the blocks and working the corner. If you need more help or tips while working this pattern, feel free to ask!